It’s always nice to relax in the living room. It’s where you entertain your guests, where you can gather as a family and where you can hang out and watch TV. It sets the tone for the rest of your house. If it’s not a place of comfort, it’s time to update your living room. There are a few different elements you can include to create a more comfortable space and make it more welcoming – both for your family and your guests. If your living room isn’t large enough to be used for entertaining, consider making it bigger as part of a whole-home remodel. Your living room can be enlarged in a number of ways, including changing the wall structure or simply incorporating it into a home addition. This will give you more space for seating and other furnishings, from sofas to sectionals to end tables. Most living rooms feature two or more windows that let in plenty of natural light. This makes the space look larger while providing more light for everyday activities, such as reading or watching TV. Accent these windows with carefully chosen window treatments. Include more natural lighting in your new layout with bay windows, French doors leading to a patio or lift-and-slide doors that highlight a beautiful view. No living room is complete without lighting for afternoon and evening use. 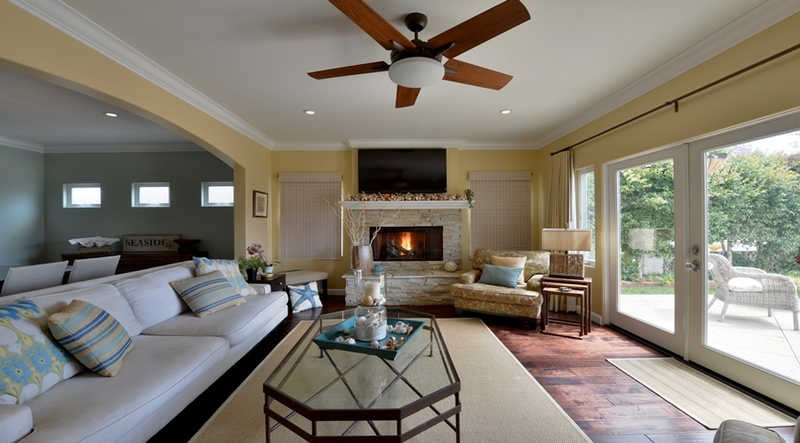 Ceiling fixtures and fans do well in large open spaces. They come in a wide range of materials, from metal and wood ceiling fans to casual and colorful light fixtures that work on a dimmer switch. If you’re considering a ceiling fan for your living room remodel, the size of the blade sweep should be proportionate to the room size. • Choose a blade sweep between 44 and 46 inches for a room that’s 90 to 100 square feet. • A 52- to 54-inch blade sweep is ideal for a room that’s 100 to 150 square feet. • Use several fans or one that’s 56 to 70 inches when your living room is more than 150 square feet. One of the problems that some home owners have with their present living room is that they can only access the room from one entry point, and often it’s only through a small doorway. Other access options include an adjoining patio with French doors, widening the doorway or creating another entryway to another room. No living room is complete without the perfect flooring selection. Ask your home remodeling designer for some suggestions or look at some of these. • Hardwood floors are available in a wide range of colors, providing a warm and welcoming look for the living room. • Bamboo and cork flooring are more eco-friendly than hardwoods, but still offer a lovely air of sophistication. They’re great choices for reducing noise in a lively setting. • Marble and porcelain tile floors are also popular options for your new living room. They not only wear well, but are also water resistant and stain resistant. A fireplace is an attractive focal point for the living room. It’s not only a great conversation piece, but it’s functional. You can choose a single-sided model, or a double-sided fireplace that is visible for your living room and in an adjoining room when placed on the common wall. There are two main styles for today’s fireplaces, traditional and modern. Which type you choose should coordinate with the style of the rest of your living room space. • Traditional fireplaces use brick or natural stone. Use earth tones to complement materials used in furniture and flooring. Gray as a neutral in home design has become more popular, making natural stone with gray tones the ideal pairing with wall color and flooring. • Modern designs are less about metal and more about glass. A glass frame with sleek lines lets you see the full fireplace and flames, creating a cozier atmosphere. Glass matches any color scheme, so it’s easy to incorporate into your new room design. To learn more about how Lars Remodeling can create a living room that perfectly suits your lifestyle, fill out the form to the right, and we’ll set up a consultation appointment for you.